Within Teamwork Projects, you can interact with your projects directly from Gmail using the Projects add-on. 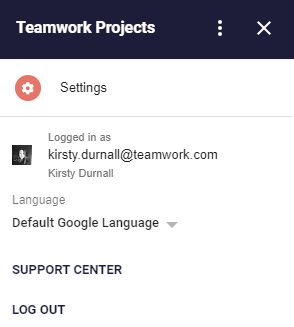 Once you have installed the add-on from the G-Suite marketplace, you will see the Teamwork Projects logo near the top right when you click into an email. When you click the icon for the first time, you will be asked to log in to your Teamwork Projects account. You can also sign up to a new account. Once you have logged in, you will be brought to an overview menu where you can add tasks, add task lists, and access your settings. 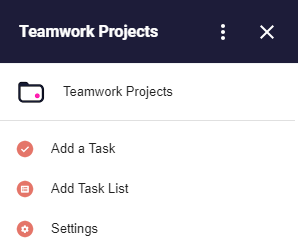 When adding a new task, you can select a project and task list to add it to. You can choose assignee(s), add tags, give the task a name and description. 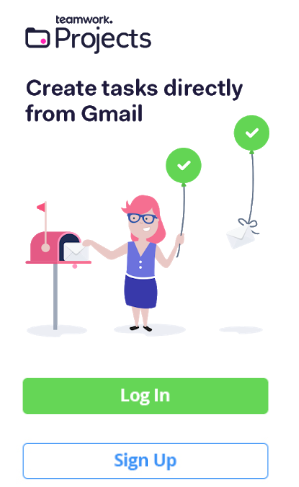 By default, the task name will be populated with the subject line of the email. You can also set estimated time, due date, priority, privacy, and include the email itself in the task. 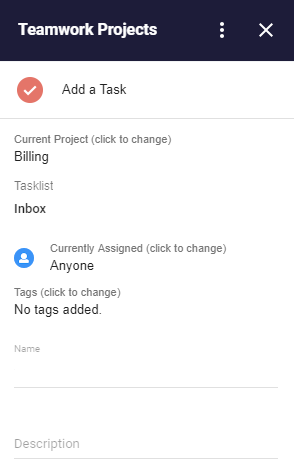 When adding a task list, you can select a project to add it to, a name for the list, and a description. In the settings area, you will see the account you are currently logged in as. You can also choose your language here, as well as access the support center, and log out. When you are in a particular view such as the add task modal, you can use the options (three dots) button in the top right to navigate to another section. To uninstall the add-on, click the options (three dots) button in the top right corner.